Hollis JohnsonChipotle just started testing a new queso dip. Chipotle is ramping up its investment in new menu items. The burrito chain just started testing a queso dip, a spring mix salad with an avocado citrus dressing, and frozen margaritas at a new test kitchen in New York that opened to the public this week. 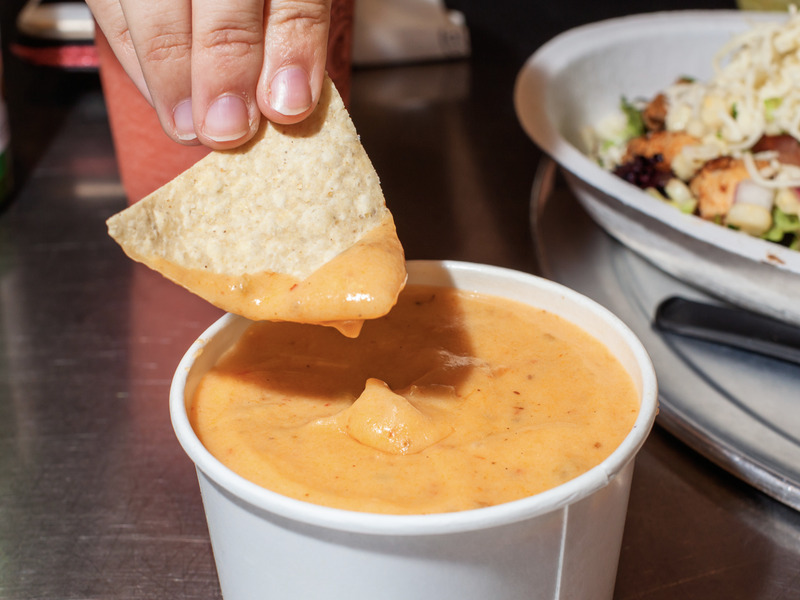 The queso in particular got tons of buzz this week, since Chipotle has said in the past that it would never serve cheese dip. In fact, prior to 2014, the company had left its menu virtually unchanged for two decades. Chipotle’s new commitment to menu changes could draw new customers, but it could also be a sign of “desperation,” according to Barclays analyst Jeffrey Bernstein. Chipotle is still recovering from massive sales declines following an E. coli outbreak in late 2015. The company has rolled out two new menu items since the outbreak: chorizo in 2016, and buñuelos — Chipotle’s first ever dessert — in 2017. But sales still haven’t rebounded to pre-outbreak levels. Chipotle CEO Steve Ells has said the company will continue to experiment with additional new menu items going forward. Adding new menu items introduces a host of potential problems, as Bernstein noted, but a menu revamp — if executed successfully — could be just what Chipotle needs. Even before the outbreak, there were signs that Chipotle customers were growing tired of the company’s menu, with sales growth contracting for several quarters leading up to the start of the outbreak in the fourth quarter of 2015. Analysts attributed that slowdown to menu fatigue, saying even the company’s most loyal customers were ready for something fresh from the restaurant chain.